Greece is suffering from a news blackout as journalists walked off the job for 24 hours, a day before the second general strike this fall is set to grip the country. 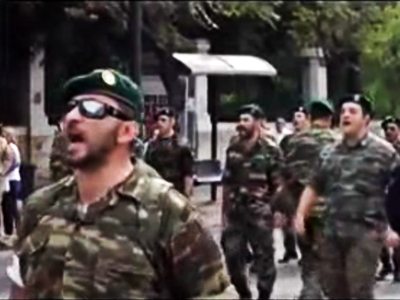 All of Greece’s TV-radio stations completely halted news broadcasts along with press. ­Hundreds of journalists, technicians at local dailies, television and radio channels and other professionals staged rallies in the center of Athens. No single newspaper was published due to the rally. Journalists were chanting slogans and holding anti-austerity banners. “We want jobs, no more unemployment. We can’t live on starvation wages in the 21st century,” read one of the banners. Doctors, pharmacists and lawyers staged a similar peaceful protest in front of the Finance Ministry. The protests have been dubbed a rehearsal of a nationwide strike set for Thursday, organized by the country’s two major trade unions. The action comes amid tense negotiations between Greece and international lenders on 11.5 billion euros ($15 billion) of budget cuts for 2013-2014. 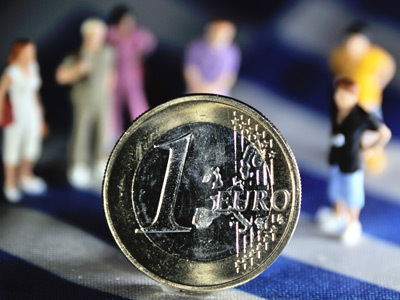 The 13.5 billion-euro austerity package is a condition from the so-called troika (International Monetary Fund, European Central Bank and European Commission). If agreed it will pave the way for Greece to a much awaited tranche from a 130-billion-euro bailout in November, which will keep it afloat. 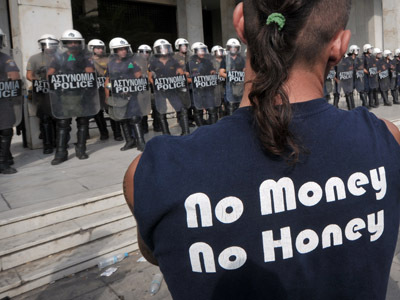 Otherwise, Greece is said to go bankrupt by December. Earlier on Tuesday, the IMF's mission chief for Greece, Poul Thomsen, declared that the two sides had agreed on "most policy issues", adding that the rest of the agreement will come soon. So far “there is an agreement on all issues except labor reforms” according to a senior Greek government official cited by Reuters. “We are on the right path," he added. The Greek leader hoped to secure the “green light” from his European counterparts during Thursday’s EU summit in Brussels. 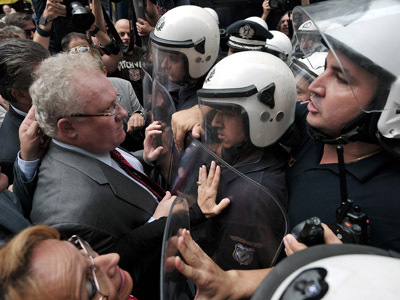 But while officials praise the agreement with international lenders, Greeks continue protests against cuts. 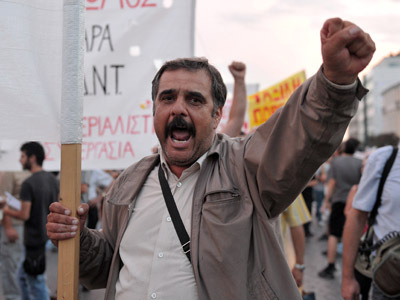 Another nationwide general strike, called by umbrella trade unions, will hit Greece on October 18. Public transportation will cease operations and hospitals will run with minimal personnel. The strike of air traffic controllers will be part of the planned general actions for three hours on Thursday morning. Protests against the austerity measures and tax hikes resumed in Greece last month after the country’s coalition government took office in July.